For those of you that didn’t already know, Retro Mode returns for another year in MLB The Show 18. Check out the trailer and let us know what you notice. As noted by TripleCrown9, Shohei Ohtani is briefly spotted at 0:47. Reds for Washington (:16), Boston (:45), and Anaheim (:47) look much improved. You can tell they use old footage because at :19 the Angels red looks worse than at :47. At 0:47 you can see Ohtani pitching. At :06 in the menu you can see the White Sox Player's Weekend uniforms, so those probably also made it in. I'd love to see those in the game, but its just a photo in the main menu, I doubt that means they made it in. I don't know, they could've picked any picture of Avisail Garcia. They chose a specific one in that uniform. According to the last deep dive, they added 19 new uniforms. From what they showed, they all looked like older ones. I would not count on these being in. Damn those modes screen are slick as ****!! They said they added 19 new throwback uniforms. They didn't say anything about other uniforms. I've already seen both Pittsburgh and some other team with last year's Memorial Day uniforms. doesnt this confirm that they took out online franchise? looking closely at the menus..
Not necessarily. If you click on franchise, it could take you to choosing offline or online. That doesn't mean they can't add in current uniforms. The 19 were throwbacks but, for example, the Nationals have a new alternate jersey this year and those are confirmed in and they don't count in the 19 new jerseys. I’m not sure that’s Ohtani pitching, since he can’t be in the game until he officially plays in a regular season game. I’m sure they’re working on his model for when he is put in. But I don’t think we will see him yet. But I was watching the video on my phone and really didn’t have a great view. So maybe I’m wrong. Anyone know if you can play a season in retro this year. Otherwise I don’t see playing it much. I would play a lot if you could play season. It’s Ohtani. I’m sure they worked out a deal with him like they did other Japanese guys in the past. Never touched retro mode last year and based on the trophy system data, not many people did. Second year won't even have the novelty value and people giving it a go to see if it's any good, so I'm kind of surprised they've bothered to keep it. This is a 1st time I can think of with someone being in the game before being in the MLBPA. It literally says Ohtani in the bottom right of the screen. Retro Mode can be fun when playing against a buddy who isn't as familiar with the current game. The simple two button scheme seems to make those folks less intimidated by the more complicated controls than from our youth. But I do agree it seems like a waste as it is. If they want to keep it in, they need to allow more modes to be played in Retro Mode. I don't mind Retro mode being in, I understand "why" it's there and "who" it's meant for but on a personal level the simplicity of the controls is what makes this a pain for me. I don't feel like I can control my pitches enough. I feel like I'm playing with my kid in the backyard soft tossing under handed to purposely allow him to get hits. I don't feel like there's enough control for the purpose of trying to get a guy out. In retro mode I feel like I'm always saying "here hit this". I can't stand that feeling. 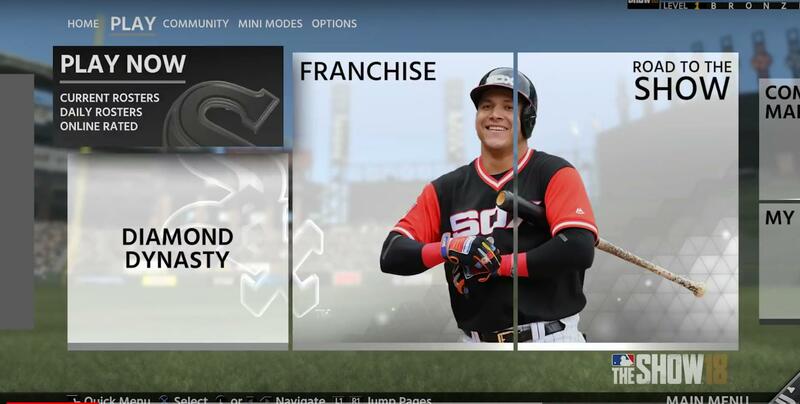 Here's the pic with Avi on the menu...I don't think I wanna take a side here but they definitely could've taken out both online franchise and season mode or kept it in a just decided not to list them as options on the main menu. My bad, you’re right. I was looking at the wrong point in the video. Very cool. Hopefully Reds as well... And Jays red alternate. I didn't touch Retro mode in 17 and probably wont in 18 but its cool that the mode is in there for those who enjoy it. So I actually enjoyed this mode because of all the action. But the changeups in the dirt killed it for me. If the team could remove those, Its actually a lot of fun. I’ll be honest, for as much as I’ve played the Show 17, I forgot this mode even existed. I hope he's in but I wouldn't get too excited yet. Back in 08 they had trailers with Fukudome on the Cubs and then when the game released he wasn't on the default roster. Wish I could play retro mode in franchise just to break up the monotony. My Thoughts exactly. Wishful thinking it gets patched in this year, or at least gets included in future releases. Online retro would be fun. As much as I liked retro mode what's the point in adding it if it's not playable in season mode? Either go all in, in year 2 or don't even bother. If they took out online franchise to expand retro mode I'm going to hit them where it hurts. By not purchasing the game. I agree. Add it to season mode, or even franchise mode. Would love to play my season with this mode to break up the monotony like someone said. I wish they would make retro mode playable online. I skipped 17, so I was not even aware retro mode existed. I agree though - if it cannot be used in season or franchise mode, what is the point? I skipped 17, so I was not even aware retro mode existed. * I agree though - if it cannot be used in season or franchise mode, what is the point? It's a fun mode to pick up and play with friends. I had a lot of fun with it last year playing with friends, but the lack of online support for it made it nearly impossible to enjoy with the majority of my friends who have moved around the country! Playing against the AI was fun for the first hour or so, then I grew tired of it. To me, it's best played against another human. The best thing that came out of Retro mode was its fielding camera. I'll play this once again, and would be compelled to do five-inning online games in this mode. Or hell, maybe even do a small 32-game season or whatever you could do in the Ken Griffey Jr. Baseball game. Though overall I wouldn't always play it. Do you honestly think the guys at SCEA, who pride themselves on "the little things" being in their game, would select the picture of a guy in a uniform that wasn't in the game? The mockup cover for last year's steelbook, which wasn't changed until something like two weeks before release, featured a uni that wasn't in the game. Got it... Wasnt very clear. No it isn't. Their maroon alternate IS in though. As a counterpoint, I loved Retro Mode, because it was new (what's old is new again). I'd grown a little tired of The Show engine, having played for hours upon hours since '08. That's nine straight years of the same engine. I love how Retro Mode plays similar to games from my childhood, but looks so, so much better. I just REALLY want Franchise or Season with tracked stats. I'd play Retro Mode much more if that was available. As another counterpoint to some other opinions in this thread, I'd personally be much less inclined to purchase 18 if they removed this mode, as it was one of my favorite parts of 17 and I've grown a bit weary of the base game.